DENTAL VENEERS are the materials thin in size, placed over the teeth so as to mainly improve an aesthetic oral appearance and to save the teeth from any further damages. In this procedure, a small amount of tooth enamel is removed with the veneer then being applied on. While they give the best natural look to our teeth, the dental veneers do also provide great strengths and resilience to them. Dental Veneers are primarily the customized tooth-shaped and colored shells that can go over our teeth; matching their size, shape and color. Tooth Jewellery is a much sought after procedure especially in the younger population who look for that additional 'sparkle' to their already sparkling and beautiful set of teeth. 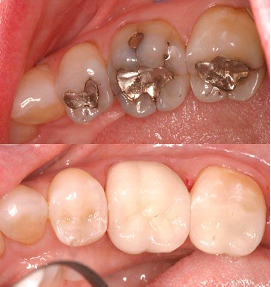 Metal fillings (amalgam/silver fillings) were effective, but very conspicuous and tend to blacken in color over time and are unsightly when you smile. We often replace old metal fillings with tooth-colored composite. Dental composite can match the shade, translucency and even the texture of your own natural teeth and provides a much better results hence a popular choice for fillings today. At Thanjai dental centre, we use high quality, international , branded materials ( 3M ESPE, VOCO, Dentsply, CeramX, Ivoclar Vivadent Tetric N-Ceram) for all fillings which gives a superior finish and make them longer lasting. A lot of factors cause teeth to lose their color such as age, food habits, medication etc. Dental bleaching or tooth whitening as its known more popularly today is one of the most sought out cosmetic treatments. If minor imperfections, such as a small cracks or chips, are stifling your smile, then dental bonding might be the right procedure for you. Tooth bonding is a one-appointment cosmetic dentistry procedure that uses composite resins to repair your minor cosmetic dental issues. Contact Dr.Rajmohan at Thanjai dental Centre for Cosmetic Dentistry to schedule your appointment today! If you have a chipped tooth, gaps, discolorations, worn-out teeth, or are in need of provisional restoration prior to more permanent and lasting veneers, then you are probably a candidate for dental bonding. At Thanjai dental Centre , we use composite resins to close gaps between teeth, eliminate minor discolored spots and repair chips. It can also be used to repair certain types of front teeth fractures. This procedure utilizes the same composite materials and process used to perform composite resin fillings. Using a high-strength, custom color-matched resin, expert cosmetic dentist Dr. Rajmohan can conceal the damaged area and reinforce the tooth, thereby creating a picture-perfect smile that looks entirely natural. Contact Thanjai dental centre for Cosmetic Dentistry If you want to repair a chipped tooth or improve tooth discoloration, call and schedule a consultation with Dr. Rajmohan to see what bonding treatments we have available for you. 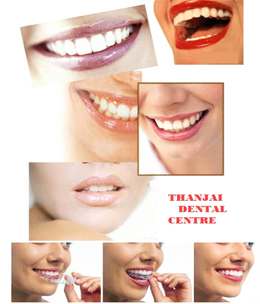 At Thanjai dental centre, we believe that every patient should be able to achieve the smile of his or her dreams. It is the art of creating a smile that enhances the features of the face, while crafting a beautiful balance in size, proportion, position, color and angulation of the teeth. It does not only add to the happiness factor of how the patient feels about himself/herself, but actually adds life to the teeth by strengthening the surfaces of teeth that are continuously exposed to wear and tear. It provides emotional wellbeing factor of harmony & improves the facial symmetry. 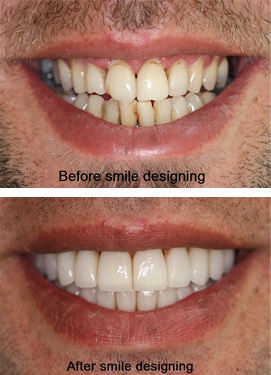 During your smile design consultation, Dr.Rajmohan will go over all of these factors. A variety of factors are taken into consideration during smile designing such as age, facial shape and the kind of image you want to portray. 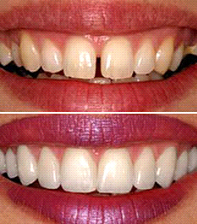 So whether you are looking for a sophisticated, sporty or a dazzling smile, can be made possible . Our dental work can include Whitening of Your teeth, Zoom Bleaching,gum reshaping and Restorative dental work is also done like the use of Bonding, veneers and crowns to make you look beautiful and wear your dazzling smile with confidence. Some of the other procedures performed include Cosmetic tooth contouring and braces as corrective therapy. Often, we also counsel the individual with tips on Teeth care before their wedding day. Having pioneered the concept of 'Smile design' and a host of cosmetic procedures, Thanjai dental has readily adopted the latest cosmetic Techniques. The idea is to ensure that the patient who has come to us to look special on their wedding day ,should be completely satisfied, happy and confident with the smile makeover, the bride / bridegroom gets. We have a reputation of transforming the lives of people with their smile designing procedures. Smile makeovers have now become routine at Thanjai dental and Dr.Rajmohan have created beautiful smiles for past 16 years and continue to do so.